Promoting her latest album She Wolf, Colombian Latin-pop singer/songwriter Shakira performed a great rendition of her new single “Did It Again” at Thursday night’s (Nov 5) 2009 MTV Europe Music Awards in Berlin. We love how the performance started out just like the music video! Truth be told, we have no idea what she’s saying (who really listens to the words anyway? LOL) but that doesn’t take away from the energy of the overall performance one bit. The ending was dope too, when she put the mic down and did the choreography with the drummers. Shakira’s new album She Wolf will be released here in the U.S. on November 23rd. Continue reading for the video of her performance. 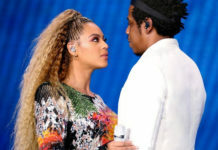 Are Beyoncé and JAY-Z (aka The Carters) Performing at the 2018 MTV VMAs Tonight?